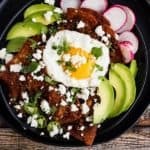 Chilaquiles with Chorizo and Red Chile Sauce--Delicious and Easy! Chilaquiles with Chorizo and Red Chile Sauce--Delicious and Easy! Like breakfast nachos, chilaquiles are a traditional Mexican brunch dish that consists of tortilla chips tossed in a flavorful chile-based sauce (either green or red) and topped with eggs, cheese, and other toppings. I like to top mine with chorizo or leftover shredded chicken, but they can just as easily be vegetarian. I use feta cheese because I like the extra tanginess. Preheat the oven to 400ºF. Line 2 large baking sheets with aluminum foil. In a bowl, toss the tortilla wedges with the olive oil until well coated. Arrange the tortilla wedges in a single layer on the prepared baking sheets (you can crowd them together, just don’t pile them on top of each other). If you prefer, you can spray the foil-lined baking sheets with olive oil spray, arrange the tortilla wedges on the sheets and then spray the tops with olive oil. Sprinkle with a bit of salt. Bake for about 10 minutes, until golden brown and crisp (you might need to cook in two batches.) Remove the chips from the pan and transfer them to a bowl. In a heavy skillet (cast-iron is ideal), brown the chorizo and then remove it to a bowl. Add the sauce to the skillet and cook over medium heat, stirring, until it is hot and bubbling, about 3 minutes. Remove the skillet from the heat and the baked chips. Toss until the chips are well coated with the sauce. To serve, pile the chips on serving plates and top with the eggs, browned chorizo, and whatever toppings you like.